NASA's Dawn spacecraft captured this image of the dwarf planet Ceres and its mysterious bright spots on May 4, 2015, from a distance of 8,400 miles (13,500 kilometers). The dwarf planet Ceres' puzzling bright spots are starting to come into focus. NASA's Dawn spacecraft has obtained the best views yet of the mysterious features, capturing them from a distance of just 8,400 miles (13,600 kilometers) in a series of images that mission team members combined to make a new video of the bright spots on Ceres. The new photos, which Dawn took on May 3 and May 4, have a resolution of 0.8 miles (1.3 km) per pixel. They reveal that the two brightest spots are actually made up of numerous small patches, though just what the features are remains a mystery, NASA officials said. "Dawn scientists can now conclude that the intense brightness of these spots is due to the reflection of sunlight by highly reflective material on the surface, possibly ice," Dawn principal investigator Christopher Russell of the University of California, Los Angeles, said in a statement. The $466 million Dawn mission launched in September 2007. From July 2011 through September 2012, Dawn orbited the protoplanet Vesta, which, like Ceres, lies in the main asteroid belt, located between Mars and Jupiter. Dawn arrived at the 590-mile-wide (950 km) Ceres on March 6, in the process becoming the first spacecraft ever to orbit a dwarf planet, as well as the first to circle two objects beyond the Earth-moon system. The probe just departed its first science orbit at Ceres; on Saturday (May 9), Dawn fired up its ion engine and began spiraling down to its second science orbit, which will take the spacecraft within 2,700 miles (4,400 km) of Ceres' surface. Dawn is expected to get there by June 6. (Ion engines are extremely efficient, but very low-thrust.) The probe will then begin a comprehensive mapping campaign that should reveal key insights about Ceres' geological history. That could include whether or not the dwarf planet is still geologically active, a possibility hinted at by a recent Hubble Space Telescope observation of apparent water-vapor plumes emanating from Ceres. 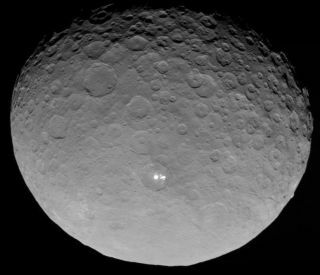 Dawn will eventually descend to two even closer-in orbits, studying Ceres from a distance of just 900 miles (1,450 km) and 230 miles (370 km) over the course of its time at the dwarf planet before wrapping up its mission in June 2016.